Michelle Doyle's depiction of Galway Cathedral. PAINTINGS OF Galway, Cork, Tralee, and even Florence, will be on display in the Galway City Library, which is about to host an exhibition by the artist Michelle Doyle. The exhibition, by Kerry born artist, Michelle Doyle, opens on Tuesday February 6 and runs until Wednesday 28. A reception to mark the official opening of the exhibition takes place on Wednesday February 7 at 6pm. The works on display have been inspired by various locations where she has lived, including Florence where she lived, worked, and exhibited for three years. She cites abstract expressionism, French impressionist Claude Monet, and Irish painter Jack B Yeats as her inspirations. 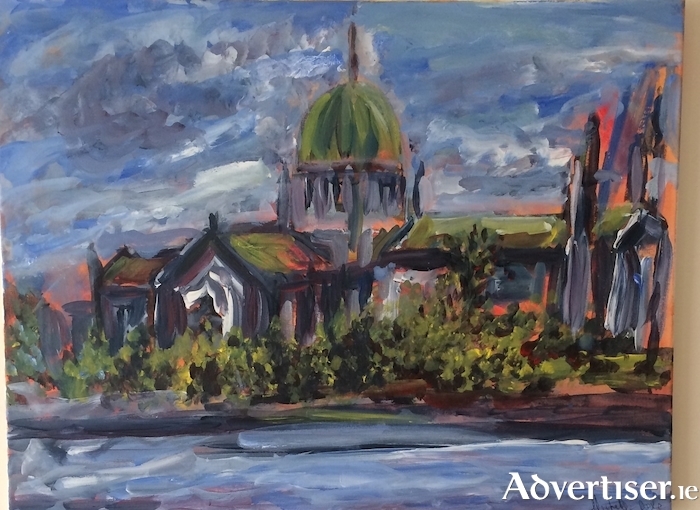 Of Galway interest will be Michelle's painting of Galway Cathedral. A Dublin collector who recently purchased 12 of her works was very keen to buy it, but she refused his offer, as she felt it should remain in Galway.